In case you missed it or are not following Wishes of a Blue Eyed Girl, this is a guest post I did for her a couple of weeks ago. Be sure to do a little Wishes of a Blue Eyed Girl Google search and you will find a new world of beautiful polish, great blogging and just a whole lot of fun! For this design, I wanted to do something bright and fun for the summer. 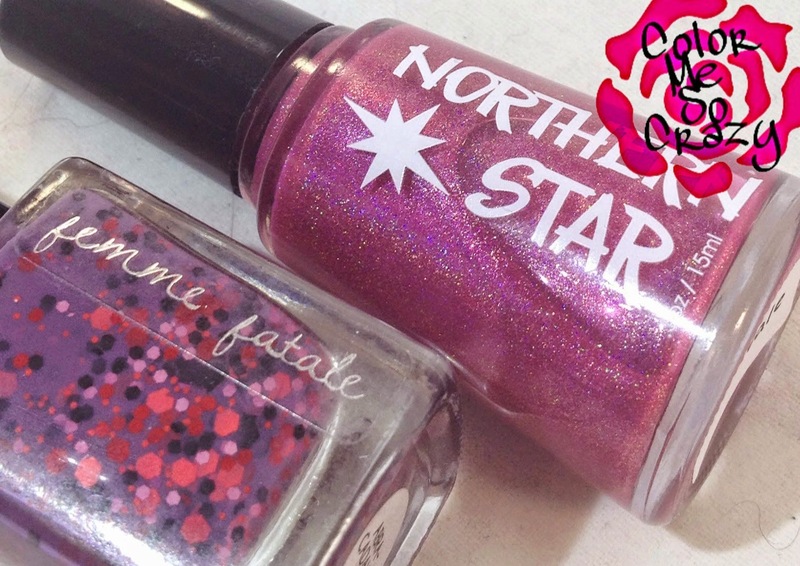 I was recently given the Femme Fatale and the Northern Star as giveaway prizes and I thought they made a great combination. 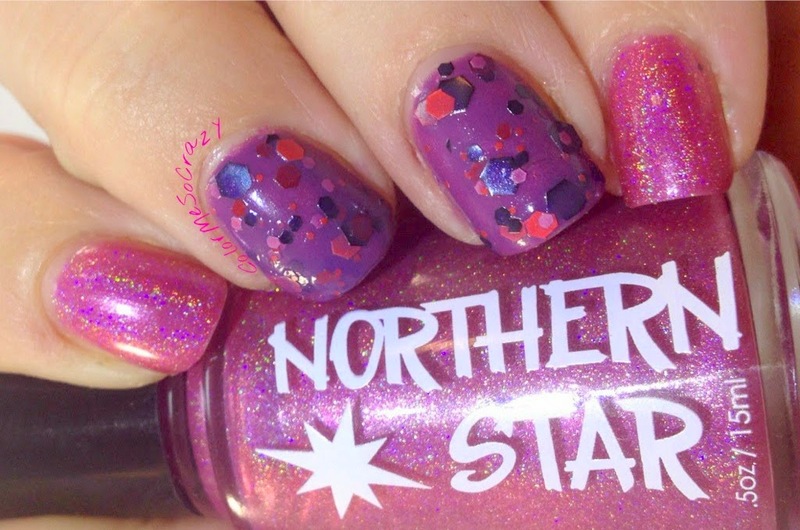 The Northern Star polish is a bright pink linear holographic polish that is just stunning in the sun. 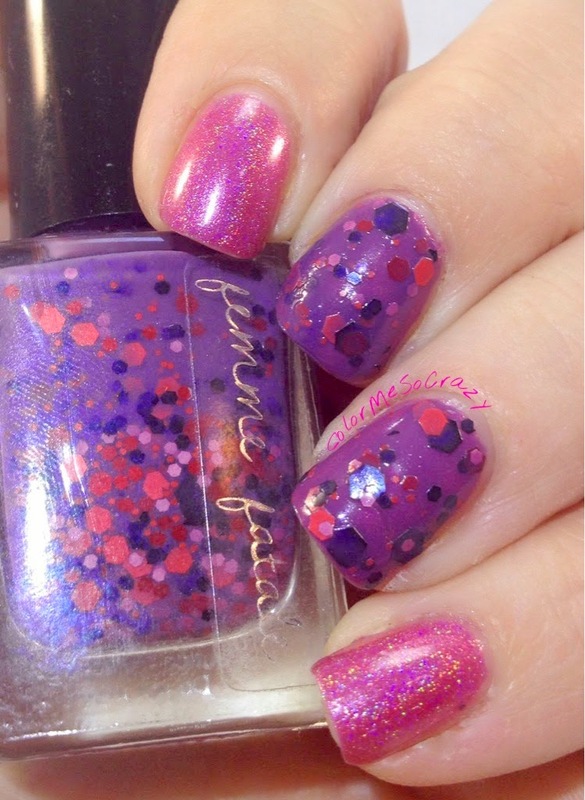 The Femme Fatale polish is a lavender crelly with lots of pink, purple and black glitters in a variety of sizes. The crelly was really nice to apply. 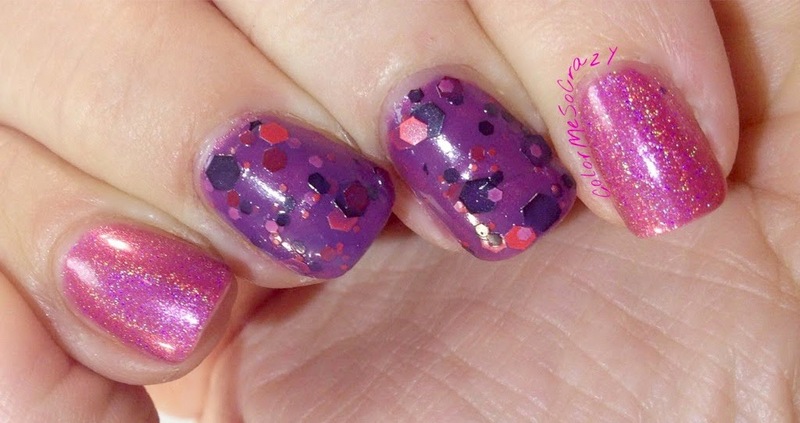 Sometimes you get a heavily loaded glitter that just clumps together and doesn't want to apply the glitter nicely. 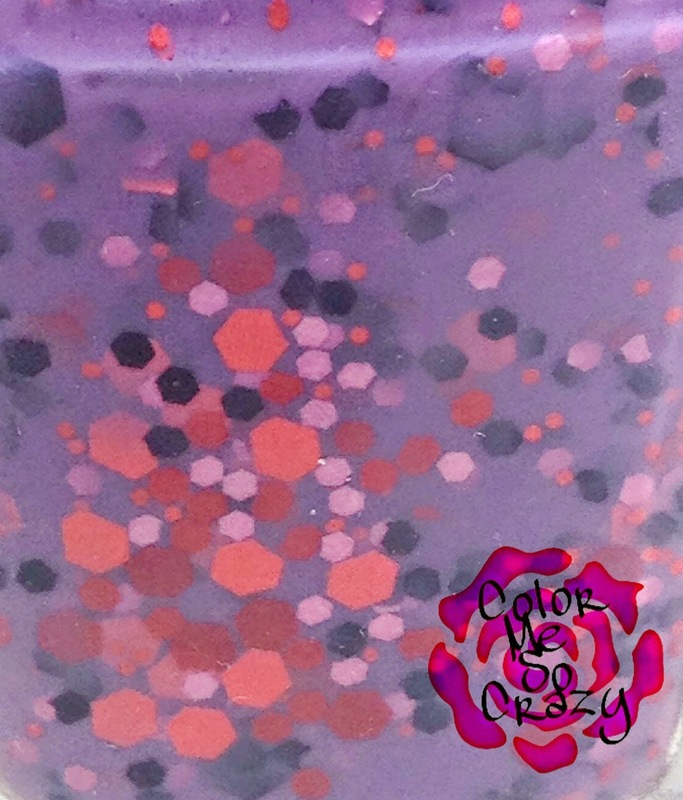 This had a nice even glitter application. A few shakes of the bottle was all I needed to mix it up. This also happens to by my first Femme Fatale polish. I am really impressed and would not mind trying more in the future. Also, since I have a new captive audience I wanted to tell you ladies about 3 great services-ish I offer on my blog. I think you will be interested in at least one of them. 1. #RedCoatTuesday- We do a link up every Tuesday in honor of Pretty Little Liars. I know Julie participates. So, if you were wondering how to get involved just send me a message under the contact tab on my blog and I will get you hooked up. 2. Make Me Pretty Giveaways- A list of all of the giveaways I can find from around the beauty world. Check back often for a chance to win some goodies!! You can find that here. 3. NFL Link Up- This is for my football girls. Once the season starts, I do a weekly link up for you all to show your pride in your NFL team. If you want in on this one, just send me a message via my contact page on my blog and I will get you all the info. Well, I hope you enjoyed looking at these pretties as well as learning some new, fun things to do around the nail and beauty world and I hope you check out some of my shenanigans in the future!